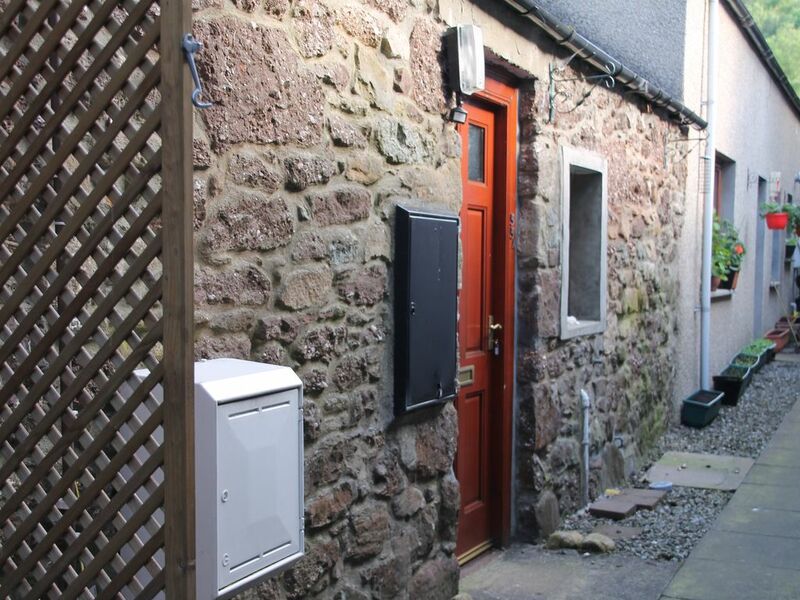 The Wee Hoose is a one bedroom terraced cottage in a small lane off Calender's Main street and near the central town square. Its a converted workshop and has been refurbished in 2013 to a very high standard, yet retains some original features such as the exposed stone walls in the lounge. The accommodation consists of entrance hall, open plan lounge and kitchen, double bedroom and shower room with WC. There is gas central heating and the heating as well as electricity is included in the rental. The kitchen is fully equipped with full size oven, ceramic hob, washing machine, microwave, toaster and kettle. There is a 24 ' wall mounted TV screen with integrated DVD player in the lounge; free WiFi internet access; the lounge also has a recliner sofa, a fold out dining table and a coffee table. The bedroom has a double bed and build in wardrobe as well as a chest of drawers for storage. Shower room is equipped with an electric shower, a sink and a WC. All bedlinen and towels will be provided. Please note the property has no garden; however, within a 5 min walk you are at the river Teith which is ideal for strolling along or just having a picnic. There are many beautiful walks around Callander and plenty of things to do. Callander is an ideal base from which to explore the central region of Scotland. Callander is situated within the Loch Lomond and Trossachs National Park. Both Glasgow and Edinburgh are about an hours drive by car. The city of Stirling in the heart of Scotland is about 30 min away by car. Please note the Wee Hoose does exactly do what it says on the tin: due to its size its best suited to a couple or single traveller; a travel cot can be provided upon request. The Wee Hoose has plenty of character! We are ourselves regular visitors to Callander, living in the nearby village of Kippen. Central location in Loch Lomond and the Trossachs National Park; an ideal base from which to explore beautiful Scotland; in Callander itself everything is within walking distance and there are plenty of activities in the surrounding area. The wee hoose was just what we needed to have a few days away. It was quiet and central. Being in the High Street the property was central, but off the beaten track. Clean and carefully planned with everything we needed. Lots of places to eat for a meal or just coffee. Easy access to other parts of the region. If the weather has been a little bit warmer there would have been lots of walking to be done. We would consider returning in warmer weather. Well equipped lovely wee house! A very nice small house with enough equipment for a nice holiday in a beautiful part of Scotland! Glad you had a good time, hope to welcome you back some time in the future. It was as advertised, a Wee Hoose. Good use of available space though but only for a short time. Biggest issue for us was the lack of dedicated car park - for checking in and out in particular. Especially in the summer when getting a park anywhere nearby is impossible. Comfortable bed and couch, good pressure shower and hot water and strong wifi. Freezer needs defrosting and mini-vac emptying and a clothes drying area or drier would be great. But perfect for a couple of nights. Thank you for staying with us, guys, and thanks for your suggestions; the freezer issue is resolved; clothes drying area is difficult as the wee hoose does exactly what is says on the tin: it is small! There is a washing machine, and there is a collapsible clothes drying rack in the cupboard in the bedroom. The wee hoose in callander. Is a great weekend place to stay . Thank you very much for staying with us, hope to see you back in the future! This is our second visit to the Wee Hoose , can not fault it for cleaniliness , warmth and comfort for 2 people looking to stay in the heart of Callander, highly recommend and very reasonably priced thankyou ! Very cute, very clean and a great wee place to enjoy the delights of Callander. Glad you liked it despite the little hiccup, it is fixed now so we will be delighted to have you back!